Karl Paul Reinhold Niebuhr (/ˈraɪnhoʊld ˈniːbʊər/; June 21, 1892 – June 1, 1971) was an American theologian, ethicist, commentator on politics and public affairs, and professor at Union Theological Seminary for more than 30 years. Niebuhr was one of America's leading public intellectuals for several decades of the 20th century and received the Presidential Medal of Freedom in 1964. Among his most influential books are Moral Man and Immoral Society and The Nature and Destiny of Man, the second of which Modern Library ranked one of the top 20 nonfiction books of the twentieth century. Niebuhr was also one of the founders of Americans for Democratic Action and spent time at the Institute for Advanced Study in Princeton, New Jersey. Starting as a minister with working-class sympathies in the 1920s and sharing with many other ministers a commitment to pacifism, his thinking evolved during the 1930s neo-orthodox realist theology as he developed the philosophical perspective known as Christian realism. He attacked utopianism as ineffectual for dealing with reality, writing in The Children of Light and the Children of Darkness (1944), "Man's capacity for justice makes democracy possible; but man's inclination to injustice makes democracy necessary." Niebuhr's realism deepened after 1945 and led him to support American efforts to confront Soviet communism around the world. A powerful speaker, he was one of the most influential thinkers of the 1940s and 1950s in public affairs. Niebuhr battled with religious liberals over what he called their naïve views of the contradictions of human nature and the optimism of the Social Gospel, and battled with the religious conservatives over what he viewed as their naïve view of scripture and their narrow definition of "true religion". During this time he was viewed by many as the intellectual rival of John Dewey. 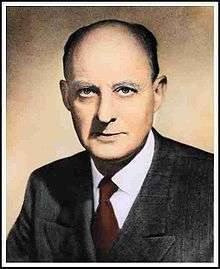 Niebuhr's long-term impact on political philosophy and political theology involve his utilizing the resources of the Christian faith to argue for political realism and his contributions to modern just war thinking. His work has also significantly influenced international relations theory, leading many scholars to move away from idealism and embrace realism. Many leading political scientists, such as George F. Kennan, Hans Morgenthau, Kenneth Waltz, and political historians, such as Richard Hofstadter, Arthur M. Schlesinger Jr., and Christopher Lasch, have noted his influence on their thinking. Andrew Bacevich labelled Niebuhr's book The Irony of American History "the most important book ever written on U.S. foreign policy". Niebuhr was born in Wright City, Missouri, the son of German immigrants Gustav Niebuhr, and his wife, Lydia (née Hosto). His father was a German Evangelical pastor; his denomination was the American branch of the established Prussian Church Union in Germany. It is now part of the United Church of Christ. The family spoke German at home. His brother H. Richard Niebuhr also became a famous theological ethicist, and his sister Hulda Niebuhr became a divinity professor in Chicago. The Niebuhr family moved to Lincoln, Illinois, in 1902 when Gustav Niebuhr became pastor of Lincoln's St. John's German Evangelical Synod church. Reinhold Niebuhr first served as pastor of a church when he served from April to September 1913 as interim minister of St. John's following his father's death. In 1931 Niebuhr married Ursula Keppel-Compton. She was a member of the Church of England and was educated at Oxford University in theology and history. She met Niebuhr while studying for her master's degree at Union Theological Seminary. For many years, she was on faculty at Barnard College (the women's college of Columbia University) where she helped establish and then chaired the religious studies department. The Niebuhrs had two children, Christopher Niebuhr and Elisabeth Sifton Niebuhr. Ursula Niebuhr left evidence in her professional papers at the Library of Congress showing that she co-authored some of her husband's later writings. In 1915, Niebuhr was ordained a pastor. The German Evangelical mission board sent him to serve at Bethel Evangelical Church in Detroit, Michigan. The congregation numbered sixty-six on his arrival and grew to nearly 700 by the time he left in 1928. The increase reflected his ability to reach people outside the German American community and among the growing population attracted to jobs in the booming automobile industry. In the early 1900s Detroit became the fourth-largest city in the country, attracting many black and white migrants from the rural South, as well as Jewish and Catholic ethnics from eastern and southern Europe. They competed for jobs and limited housing, and the city's rapid changes and rise in social tensions contributed to the growth in numbers of Ku Klux Klan members in the city, which reached its peak in 1925, and to the Black Legion. During that year's city election campaign, in which the Klan publicly supported several candidates, including for the office of mayor, Niebuhr spoke out publicly against the Klan to his congregation, describing them as "one of the worst specific social phenomena which the religious pride of a people has ever developed". Only one of their several candidates gained a seat on the city council, and Charles Bowles, the mayoral candidate, was defeated. Several attempts have been made to explicate the origins of Niebuhr's sympathies from the 1920s to working class and labor class issues as documented by his biographer Richard W. Fox. One supportive example has concerned his interest in the plight of auto workers in Detroit. This one interest among others can be briefly summarized below. After seminary, Niebuhr preached the Social Gospel, and then initiated the engagement of what he considered the insecurity of Ford workers. Niebuhr had moved to the left and was troubled by the demoralizing effects of industrialism on workers. He became an outspoken critic of Henry Ford and allowed union organizers to use his pulpit to expound their message of workers' rights. Niebuhr attacked poor conditions created by the assembly lines and erratic employment practices. The historian Ronald H. Stone thinks that Niebuhr never talked to the assembly line workers (many of his parishioners were skilled craftsmen) but projected feelings onto them after discussions with Rev. Samuel Marquis. Niebuhr's criticism of Ford and capitalism resonated with progressives and helped make him nationally prominent. His serious commitment to Marxism developed after he moved to New York in 1928. In 1928, Niebuhr left Detroit to become Professor of Practical Theology at Union Theological Seminary in New York. He spent the rest of his career there, until retirement in 1960. While teaching theology at Union Theological Seminary, Niebuhr influenced many generations of students and thinkers, including the German minister Dietrich Bonhoeffer of the anti-Nazi Confessing Church. The Fellowship of Socialist Christians was organized in the early 1930s by Niebuhr and others with similar views. Later it changed its name to Frontier Fellowship and then to Christian Action. The main supporters of the Fellowship in the early days included Eduard Heimann, Sherwood Eddy, Paul Tillich and Rose Terlin. In its early days the group thought capitalist individualism was incompatible with Christian ethics. Although not Communist, the group acknowledged Karl Marx's social philosophy. Niebuhr was among the group of 51 prominent Americans who formed the International Relief Association (IRA) that is today known as the International Rescue Committee (IRC). The committee mission was to assist Germans suffering from the policies of the Hitler regime. In the 1930s Niebuhr was often seen as an intellectual opponent of John Dewey. Both men were professional polemicists and their ideas often clashed, although they contributed to the same realms of liberal intellectual schools of thought. Niebuhr was a strong proponent of the "Jerusalem" religious tradition as a corrective to the secular "Athens" tradition insisted upon by Dewey. In the book Moral Man and Immoral Society (1932), Niebuhr strongly criticized Dewey's philosophy, although his own ideas were still intellectually inchoate. Two years later, in a review of Dewey's book A Common Faith (1934), Niebuhr was calm and respectful towards Dewey's "religious footnote" on his then large body of educational and pragmatic philosophy. ... About midway in my ministry which extends roughly from the peace of Versailles  to the peace of Munich , measured in terms of Western history, I underwent a fairly complete conversion of thought which involved rejection of almost all the liberal theological ideals and ideas with which I ventured forth in 1915. I wrote a book [Does Civilization need Religion? ], my first, in 1927 which ... contains almost all the theological windmills against which today I tilt my sword. These windmills must have tumbled shortly thereafter for every succeeding volume expresses a more and more explicit revolt against what is usually known as liberal culture. In the 1930s Niebuhr worked out many of his ideas about sin and grace, love and justice, faith and reason, realism and idealism, and the irony and tragedy of history, which established his leadership of the neo-orthodox movement in theology. Influenced strongly by Karl Barth and other dialectical theologians of Europe, he began to emphasize the Bible as a human record of divine self-revelation; it offered for Niebuhr a critical but redemptive reorientation of the understanding of humanity's nature and destiny. Niebuhr couched his ideas in Christ-centered principles such as the Great Commandment and the doctrine of original sin. His major contribution was his view of sin as a social event—as pride—with selfish self-centeredness as the root of evil. The sin of pride was apparent not just in criminals, but more dangerously in people who felt good about their deeds—rather like Henry Ford (whom he did not mention by name). The human tendency to corrupt the good was the great insight he saw manifested in governments, business, democracies, utopian societies, and churches. This position is laid out profoundly in one of his most influential books, Moral Man and Immoral Society (1932). He was a debunker of hypocrisy and pretense and made the avoidance of self-righteous illusions the center of his thoughts. Niebuhr argued that to approach religion as the individualistic attempt to fulfill biblical commandments in a moralistic sense is not only an impossibility but also a demonstration of man's original sin, which Niebuhr interpreted as self-love. Through self-love man becomes focused on his own goodness and leaps to the false conclusion—one he called the "Promethean illusion"—that he can achieve goodness on his own. Thus man mistakes his partial ability to transcend himself for the ability to prove his absolute authority over his own life and world. Constantly frustrated by natural limitations, man develops a lust for power which destroys him and his whole world. History is the record of these crises and judgments which man brings on himself; it is also proof that God does not allow man to overstep his possibilities. In radical contrast to the Promethean illusion, God reveals himself in history, especially personified in Jesus Christ, as sacrificial love which overcomes the human temptation to self-deification and makes possible constructive human history. During the 1930s, Niebuhr was a prominent leader of the militant faction of the Socialist Party of America, although he disliked die-hard Marxists. He described their beliefs as a religion and a thin one at that. In 1941, he co-founded the Union for Democratic Action, a group with a strongly militarily interventionist, internationalist foreign policy and a pro-union, liberal domestic policy. He was the group's president until it transformed into the Americans for Democratic Action in 1947. This departure from his peers evolved into a movement known as Christian Realism. Niebuhr is widely considered to have been its primary advocate. Niebuhr supported the Allies during World War II and argued for the engagement of the United States in the war. As a writer popular in both the secular and the religious arena and a professor at the Union Theological Seminary, he was very influential both in the United States and abroad. While many clergy proclaimed themselves pacifists because of their World War I experiences, Niebuhr declared that a victory by Germany and Japan would threaten Christianity. He renounced his socialist connections and beliefs and resigned from the pacifist Fellowship of Reconciliation. He based his arguments on the Protestant beliefs that sin is part of the world, that justice must take precedence over love, and that pacifism is a symbolic portrayal of absolute love but cannot prevent sin. Although his opponents did not portray him favorably, Niebuhr's exchanges with them on the issue helped him mature intellectually. Niebuhr debated Charles Clayton Morrison, editor of The Christian Century magazine, about America's entry into World War II. Morrison and his pacifistic followers maintained that America's role should be strictly neutral and part of a negotiated peace only, while Niebuhr claimed himself to be a realist, who opposed the use of political power to attain moral ends. Morrison and his followers strongly supported the movement to outlaw war that began after World War I and the Kellogg-Briand Pact of 1928. The pact was severely challenged by the Japanese invasion of Manchuria in 1931. With his publication of Moral Man and Immoral Society (1932), Niebuhr broke ranks with The Christian Century and supported interventionism and power politics. He supported the reelection of President Franklin D. Roosevelt in 1940 and published his own magazine, Christianity and Crisis. In 1945, however, Niebuhr charged that use of the atomic bomb on Hiroshima was "morally indefensible". Traditionally, the idea of the frailty of man led to the demand for obedience to ordained authority. But Niebuhr rejected that ancient conservative argument. Ordained authority, he showed, is all the more subject to the temptations of self-interest, self-deception and self-righteousness. Power must be balanced by power. He persuaded me and many of my contemporaries that original sin provides a far stronger foundation for freedom and self-government than illusions about human perfectibility. Niebuhr's analysis was grounded in the Christianity of Augustine and Calvin, but he had, nonetheless, a special affinity with secular circles. His warnings against utopianism, messianism and perfectionism strike a chord today.... We cannot play the role of God to history, and we must strive as best we can to attain decency, clarity and proximate justice in an ambiguous world. The contemporary liberal's fascination with Niebuhr, I suggest, comes less from Niebuhr's dark theory of human nature and more from his actual political pronouncements, from the fact that he is a shrewd, courageous, and right-minded man on many political questions. Those who applaud his politics are too liable to turn then to his theory of human nature and praise it as the philosophical instrument of Niebuhr's political agreement with themselves. But very few of those whom I have called "atheists for Niebuhr" follow this inverted logic to its conclusion: they don't move from praise of Niebuhr's theory of human nature to praise of its theological ground. We may admire them for drawing the line somewhere, but certainly not for their consistency. Most U.S. liberals think of Niebuhr as a solid socialist who has some obscure connection with Union Theological Seminary that does not interfere with his political work. Unlike most clergymen in politics, Dr. Niebuhr is a pragmatist. Says James Loeb, secretary of Americans for Democratic Action: "Most so-called liberals are idealists. They let their hearts run away with their heads. Niebuhr never does. For example, he has always been the leading liberal opponent of pacifism. In that period before we got into the war when pacifism was popular, he held out against it steadfastly. He is also an opponent of Marxism. His views developed during his pastoral tenure in Detroit, which had become a place of immigration, migration, competition and development as a major industrial city. During the 1920s, Niebuhr spoke out against the rise of the Ku Klux Klan in Detroit, which had recruited many members threatened by the rapid social changes. The Klan proposed positions that were anti-black, anti-Jewish and anti-Catholic. Niebuhr's preaching against the Klan, especially in relation to the 1925 mayoral election, gained him national attention. Niebuhr's thoughts on racial justice developed slowly after he abandoned socialism. Niebuhr attributed the injustices of society to human pride and self-love and believed that this innate propensity for evil could not be controlled by humanity. But, he believed that a representative democracy could improve society's ills. Like Edmund Burke, Niebuhr endorsed natural evolution over imposed change and emphasized experience over theory. Niebuhr's Burkean ideology, however, often conflicted with his liberal principles, particularly regarding his perspective on racial justice. Though vehemently opposed to racial inequality, Niebuhr adopted a conservative position on segregation. Anti-Catholicism surged in Detroit in the 1920s in reaction to the rise in the number of Catholic immigrants from southern Europe since the early 20th century. It was exacerbated by the revival of the Ku Klux Klan, which recruited many members in Detroit. Niebuhr defended pluralism by attacking the Klan. During the Detroit mayoral election of 1925, Niebuhr's sermon, "We fair-minded Protestants cannot deny", was published on the front pages of both the Detroit Times and the Free Press. that it was Protestantism that gave birth to the Ku Klux Klan, one of the worst specific social phenomena which the religious pride and prejudice of peoples has ever developed.... I do not deny that all religions are periodically corrupted by bigotry. But I hit Protestant bigotry the hardest at this time because it happens to be our sin and there is no use repenting for other people's sins. Let us repent of our own.... We are admonished in Scripture to judge men by their fruits, not by their roots; and their fruits are their character, their deeds and accomplishments. In the "Letter from Birmingham Jail" Martin Luther King Jr. wrote, "Individuals may see the moral light and voluntarily give up their unjust posture; but, as Reinhold Niebuhr has reminded us, groups tend to be more immoral than individuals." King drew more heavily upon Niebuhr's social and ethical ideals than on anyone else (including Gandhi). King invited Niebuhr to participate in the third Selma to Montgomery March in 1965, and Niebuhr responded by telegram: "Only a severe stroke prevents me from accepting ... I hope there will be a massive demonstration of all the citizens with conscience in favor of the elemental human rights of voting and freedom of assembly" (Niebuhr, March 19, 1965). Two years later, Niebuhr defended King's decision to speak out against the Vietnam War, calling him "one of the greatest religious leaders of our time". Niebuhr asserted: "Dr. King has the right and a duty, as both a religious and a civil rights leader, to express his concern in these days about such a major human problem as the Vietnam War." Of his country's intervention in Vietnam, Niebuhr admitted: "For the first time I fear I am ashamed of our beloved nation." As a young pastor in Detroit, he favored conversion of Jews to Christianity, scolding evangelical Christians who were anti-Semitic or ignoring them. He spoke out against "the unchristlike attitude of Christians" and what he described as his fellow Christians' "Jewish bigotry". His 1933 article in the Christian Century was an attempt to sound the alarm within the Christian community over Hitler's "cultural annihilation of the Jews". Eventually his theology evolved to the point where he was the first prominent Christian theologian to argue it was inappropriate for Christians to seek to convert Jews to their faith. In 1952, Niebuhr published The Irony of American History, in which he interpreted the meaning of the United States' past. Niebuhr questioned whether a humane, "ironical" interpretation of American history was credible on its own merits, or only in the context of a Christian view of history. Niebuhr's concept of irony referred to situations in which "the consequences of an act are diametrically opposed to the original intention", and "the fundamental cause of the disparity lies in the actor himself, and his original purpose." His reading of American history based on this notion, though from the Christian perspective, is so rooted in historical events that readers who do not share his religious views can be led to the same conclusion. Niebuhr's great foe was idealism. American idealism, he believed, comes in two forms: the idealism of the antiwar non-interventionists, who are embarrassed by power; and the idealism of pro-war imperialists, who disguise power as virtue. He said the non-interventionists, without mentioning Harry Emerson Fosdick by name, seek to preserve the purity of their souls, either by denouncing military actions or by demanding that every action taken be unequivocally virtuous. They exaggerate the sins committed by their own country, excuse the malevolence of its enemies and, as later polemicists have put it, inevitably blame America first. Niebuhr argued this approach was a pious way to refuse to face real problems. Niebuhr exerted a significant influence upon mainline Protestant clergy in the years immediately following World War II, much of it in concord with the neo-orthodox and the related movements. That influence began to wane and then drop toward the end of his life. The historian Arthur M. Schlesinger Jr. in the late twentieth century described the legacy of Niebuhr as being contested between American liberals and conservatives, both of whom wanted to claim him. Martin Luther King Jr. gave credit to Niebuhr's influence. Foreign-policy conservatives point to Niebuhr's support of the containment doctrine during the Cold War as an instance of moral realism; progressives cite his later opposition to the Vietnam War. In more recent years, Niebuhr has enjoyed something of a renaissance in contemporary thought, although usually not in liberal Protestant theological circles. Both major-party candidates in the 2008 presidential election cited Niebuhr as an influence: Senator John McCain, in his book Hard Call, "celebrated Niebuhr as a paragon of clarity about the costs of a good war". President Barack Obama said that Niebuhr was his "favorite philosopher" and "favorite theologian". Slate magazine columnist Fred Kaplan characterized Obama's 2009 Nobel Peace Prize acceptance speech a "faithful reflection" of Niebuhr. Kenneth Waltz's seminal work on international relations theory, Man, the State, and War, includes many references to Niebuhr's thought. Waltz emphasizes Niebuhr's contributions to political realism, especially "the impossibility of human perfection". Andrew Bacevich's book The Limits of Power: The End of American Exceptionalism refers to Niebuhr 13 times. Bacevich emphasises Niebuhr's humility and his belief that Americans were in danger of becoming enamored of U.S. power. Other leaders of American foreign policy in the late twentieth century and early twenty-first century have acknowledged Niebuhr's importance to them, including Jimmy Carter, Madeleine Albright, and Hillary Clinton. During his lifetime, Niebuhr was awarded several honorary doctorates. In 1964, President Lyndon B. Johnson awarded Niebuhr the Presidential Medal of Freedom. In Niebuhr's honor, New York City named West 120th Street between Broadway and Riverside Drive Reinhold Niebuhr Place. This is the site of Union Theological Seminary in Manhattan, where Niebuhr taught for more than 30 years. Elmhurst College, his alma mater, established the Niebuhr Medal to honor him and his brother. He possessed a deep voice and large blue eyes. He used his arms as though he were an orchestra conductor. Occasionally one hand would strike out, with a pointed finger at the end, to accent a trenchant sentence. He talked rapidly and (because he disliked to wear spectacles for his far-sightedness) without notes; yet he was adroit at building logical climaxes and in communicating a sense of passionate involvement in what he was saying. ↑ "100 Best Nonfiction". Modern Library. 1998. Retrieved March 4, 2015. ↑ "About ADA". Americans for Democratic Action. Retrieved March 15, 2015. ↑ "Reinhold Niebuhr by Howard G. Patton". religion-online.org. Retrieved March 15, 2015. ↑ Krista Tippett (October 25, 2007). "Reinhold Niebuhr Timeline: Accepts position at Princeton". On Being. Retrieved March 15, 2015. ↑ Brown, Robert McAfee, (1986). The Essential Reinhold Niebuhr: Selected Essays and Addresses, Yale University Press, pp. xv-xiv. 1 2 3 4 Arthur Schlesinger, Jr. (September 18, 2005). "Forgetting Reinhold Niebuhr". The New York Times. Retrieved October 13, 2012. ↑ "Reinhold Niebuhr and John Dewey: An American Odyssey, Daniel F. Rice — Author". SUNY Press. March 1993. Retrieved March 15, 2015. ↑ "Political Realism in International Relations". Stanford Encyclopedia of Philosophy. April 2, 2013. Retrieved March 15, 2015. ↑ Kamminga, Menno R. (9 July 2012). "Structure and Sin: The Niebuhrian Roots of Waltz's Neorealist Theory of International Politics". Philica.com. ISSN 1751-3030. Retrieved March 15, 2015. 1 2 Brian Urquhart (March 26, 2009). "What You Can Learn from Reinhold Niebuhr". The New York Review of Books. Retrieved March 15, 2015. ↑ Brooks, David (April 26, 2007). "Obama, Gospel and Verse". The New York Times. p. A25. Retrieved March 15, 2015. ↑ "Niebuhr and Obama". Hoover Institution. April 1, 2009. Retrieved March 15, 2015. ↑ "Reinhold Niebuhr and the Political Moment". Religion & Ethics Newseekly. PBS. September 7, 2007. Archived from the original on March 10, 2013. ↑ Hoffman, Claire. "Under God: Spitzer, Niebuhr and the Sin of Pride". The Washington Post. Archived from the original on September 21, 2013. ↑ Krista Tippett (October 25, 2007). "Reinhold Niebuhr Timeline: Opposes Vietnam War". On Being. Retrieved March 15, 2015. ↑ Schlesinger Jr, Arthur (June 22, 1992). "Reinhold Niebuhr's Long Shadow". The New York Times. Archived from the original on December 8, 2009. ↑ "Friends He Met in America: Reinhold Nieburh". Christian History. October 1, 1991. Retrieved March 15, 2015. ↑ Jordan Michael Smith (October 17, 2011). "The Philosopher of the Post-9/11 Era: Why have the right and the left resurrected Reinhold Niebuhr?". Slate Magazine. Retrieved March 15, 2015. ↑ "Hall of Famous Missourians". Missouri House of Representatives. Retrieved March 15, 2015. ↑ Yun Jung Moon (2009). "Reinhold Niebuhr (1892–1971)". Boston Collaborative Encyclopedia of Modern Western Theology. Retrieved March 15, 2015. ↑ Fox, Richard (1985). Reinhold Niebuhr. San Francisco: Harper & Row. pp. 5–24. ISBN 0-06-250343-X. ↑ Elmhurst College has erected a statue in his honor. ↑ Lemert, Charles (2011). Why Niebuhr Matters. New Haven: Yale University Press. p. 146. ISBN 978-0-300-17542-4. ↑ Richard Fox (1985). Reinhold Niebuhr: A Biography. ↑ Rebekah Miles, "Uncredited: Was Ursula Niebuhr Reinhold's Coauthor?" The Christian Century, January 25. ↑ Kenneth T. Jackson (1992) . The Ku Klux Klan in the City, 1915–1930. p. 142. ↑ Jackson 1967/1992, p. 142. ↑ See Reinhold Niebuhr, "Detroit" (radio interview online). ↑ Some others included philosopher John Dewey and writer John Dos Passos. ↑ "New German Relief Unit: American Branch Formed to Aid Work Headed by Einstein". The New York Times. July 24, 1933. p. 11. Retrieved March 15, 2015. ↑ Niebuhr, Reinhold (April 26, 1939). "Ten Years That Shook My World". The Christian Century. in Baritz, Loren, ed. (1960). Sources of the American Mind. II. pp. 542–46. ↑ Fox. "7–8". Reinhold Niebuhr. 1 2 3 Whitman, Alden (June 2, 1971). "Reinhold Niebuhr Is Dead; Protestant Theologian, 78" (PDF). The New York Times. Retrieved August 20, 2011. ↑ Brown, Niebuhr and His Age: Reinhold Niebuhr's Prophetic Role and Legacy, 2002, p. 102. ↑ Matthew Berke (November 1992). "The Disputed Legacy of Reinhold Niebuhr". First Things. Archived from the original on June 10, 2011. ↑ Doenecke, Justus D. (1995). "Reinhold Niebuhr and his Critics: The Interventionist Controversy in World War II". Anglican and Episcopal History. 64 (4): 459–481. ↑ Bullert, Gary B. (2002). "Reinhold Niebuhr and the Christian Century: World War II and the Eclipse of the Social Gospel". Journal of Church and State. 44 (2): 271–290. doi:10.1093/jcs/44.2.271. ↑ "Religion: Faith for a Lenten Age". Time. March 8, 1948. 1 2 Robinson, Greg (2000). "Reinhold Niebuhr: The Racial Liberal as Burkean". Prospects. 25 (641–661): 0361–2333. ↑ Jessica McElrath (2007). The Everything Martin Luther King, Jr. Book: The Struggle, The Tragedy, The Dream. Everything Books. p. 48. ↑ He wrote several articles regarding the pre- and post-World War II plight of European Jews: "Jews After the War" (in 2 parts Nation February 21 and February 28, 1942, pages 214–216 and 253–255), "It Might Have Been" (Evangelical Herald March 29, 1923, page 202), "The Rapprochement Between Jews and Christians" (Christian Century January 7, 1926, pages 9–11), "Germany Must Be Told" (Christian Century August 9, 1933, pages 1014–1015, follow-up Letter to the Editor in to this article same journal May 27, 1936, p. 771). ↑ Eyal Naveh, "Unconventional 'Christian Zionist': The Theologian Reinhold Niebuhr and his Attitude toward the Jewish National Movement". Studies in Zionism 1990 11(2): 183–196; 1991 12(1): 85–88. ↑ "The Origin of our Serenity Prayer". Retrieved 2007-10-09. ; Goodstein, Laurie (July 11, 2008). "Serenity Prayer faces challenge on authorship". The New York Times. Retrieved March 15, 2015. ↑ Laurie Goodstein (November 27, 2009). "Serenity Prayer Skeptic Now Credits Niebuhr". The New York Times. p. A11. Retrieved March 15, 2015. ↑ Matthew Berke, "The Disputed Legacy of Reinhold Niebuhr", First Things (November 1992). ↑ Elie, Paul. "A Man for All Reasons", The Atlantic, November 2007. ↑ Paul Allen, "The Obama Niebuhr connection", The Toronto Star (June 14, 2008). ↑ "Obama's Favorite Theologian? A Short Course on Reinhold Niebuhr", "Pew Research" (June 26, 2009). ↑ Fred Kaplan (10 December 2009). "Obama's War and Peace". Slate. Retrieved March 19, 2010. Beckley, Harlan. Passion for Justice: Retrieving the Legacies of Walter Rauschenbusch, John A. Ryan, and Reinhold Niebuhr, (1992). 391 pp. Brown, Charles C. Niebuhr and His Age: Reinhold Niebuhr's Prophetic Role in the Twentieth Century, (1992). 317 pp. Chen, Liang. "From a Christian Socialist to a Christian Realist: Reinhold Niebuhr and the Soviet Union, 1930–1945". Ph.D. dissertation, Department of History, National University of Singapore, 2007. Crouter, Richard. Reinhold Niebuhr: On Politics, Religion, and Christian Faith (2010). Kennealy, Peter (1985) "History, Politics, and the Sense of Sin: The Case of Reinhold Niebuhr", In Athanasios Moulakis (ed. ), The Promise of History: Essays in Political Philosophy, W. De Gruyter. Offers a systematic and analytic account of the central categories of Niebuhr's political theology and philosophy of history. Lovin, Robin (2003). "Reinhold Niebuhr in Contemporary Scholarship". Journal of Religious Ethics. 31 (3): 489–505. doi:10.1111/1467-9795.00149. JSTOR 40008340. McCann, Dennis. Christian Realism and Liberation Theology (1981). Meyer, Donald B. The Protestant Search for Political Realism, 1919–1941 (1960). Rice, Daniel F. Reinhold Niebuhr and John Dewey: An American Odyssey, (1993). 358 pp. Warren, Heather A. Theologians of a New World Order: Reinhold Niebuhr and the Christian Realists, 1920–1948, (1997). 199 pp.